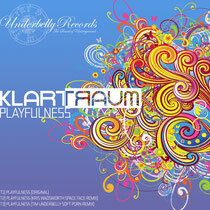 Klartraum make their debut for Londonʼs Underbelly Records this summer with the ʻPlayfulnessʼrelease, backed with remixes from Kris Wadsworth and label boss Tim Underbelly. Over the past few years Klartraumʼs dubbed out, open minded take on house, techno and electronica has turned many a critic, club and record buyerʼs head. Live sets at Fabric and Kazantip have marked the act, comprising Nadja Lind and Helmut Ebritsch, as true masters of their craft while two albums for their own Lucidflow imprint have displayed their versatility and adventurous spirit. ʻPlayfulnessʼ sees the German duo in fine form, turning in a slice of skipping house that welds organic percussion to a heavily electronic groove that slowly unfurls into a warm, synth-led number that owes as much to Chicago as it does to European micro-house. Kris Wadsworth strips away the intricate trademark Klartraum detail and pans out to the overall feel with his ʻSpace Faceʼ interpretation. Looped keys sit back in the mix while floating chords ride the kick-focused rhythm before opening into a mesmerising blanket of melody. Tim Underbelly, label boss alongside his sibling Amy, heads up the final remix of the release and provides a subtle, undulating version which uses samples, field recordings and a nagging arpeggio to create a trippy, understated and balanced atmosphere throughout. It’s out late-May on vinyl followed by a digital release early June.